Imagine the Los Angeles River before its metamorphosis into a concrete flood control channel, and Mark Twain’s quip about falling into a California river and coming out “all dusty” might come to mind. But the historical record, including photos like the one above, paints a much different picture. Before human civilization transformed it, the L.A. River flowed in some places through grassy oak woodland. In others it coursed through a dense forest of willows, cottonwoods, and sycamores. Steelhead trout swam through its currents, antelope and deer paused at its banks to drink, and grizzly bears ambled into its waters for food. After a winter storm, the tame stream became a whitecapped fury. In the parched summer months, the river plunged below the surface where it encountered the porous soil of the Los Angeles Basin. But at the Glendale Narrows, shallow bedrock forced the stream aboveground, guaranteeing a year-round flow. In other places, where the parking lots of Beverly Hills, Compton, and Hollywood bake in the sun today, groundwater hydrology conspired with seasonal flooding to create a vast system of marshes, ponds, and other wetlands teeming with plant and animal life. For centuries, the Los Angeles River also sustained human life in the area. As Blake Gumprecht explains in his masterful history, The Los Angeles River: Its Life, Death, and Possible Rebirth, Gabrieleño (Tongva) Indians collected tule from its banks to thatch their huts, and later the Spanish agricultural village of Los Angeles built a system of ditches (zanjas) to irrigate its fields. 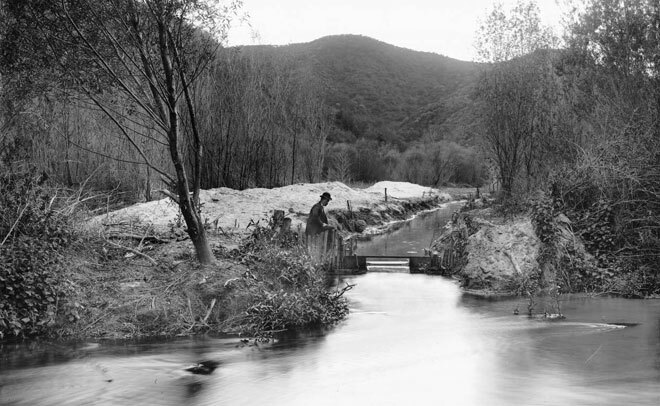 In the photo above, circa 1900, the man in the bowler cap works a sluice gate for the city’s Canal and Reservoir system. One of many systems that diverted water from the river for industrial, agricultural, and household uses, the one pictured here took water from a point north of Griffith Park, through the hills of the present-day Silver Lake district, and into a reservoir that eventually became—in shrunken form—Echo Park Lake. Previous articleThe Hollywood Bowl Summer Series Schedule Has Been Posted! What Will the L.A. River Look Like in the Future? So, When Is it OK to Float Down the L.A. River?